In honor of Towel Day, the boys decided to curl up with their towels and The Hitchhiker's Guide to the Galaxy. Henry: "Shhh, Momma. Zachary's getting to the really, REALLY good part." 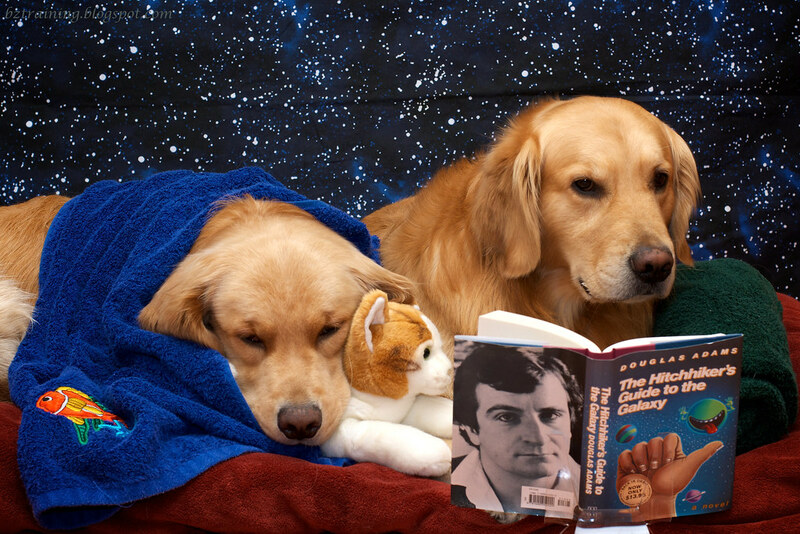 Towel Day was started back in 2001, two weeks after the author's (Douglas Adams) death. Ok, Ok... I get the hint. I'll leave you to your reading. 207. Wrapped Up - Share a picture of your dog wrapped up in something today! Scavenge Challenge May 25, 2012 - "25). 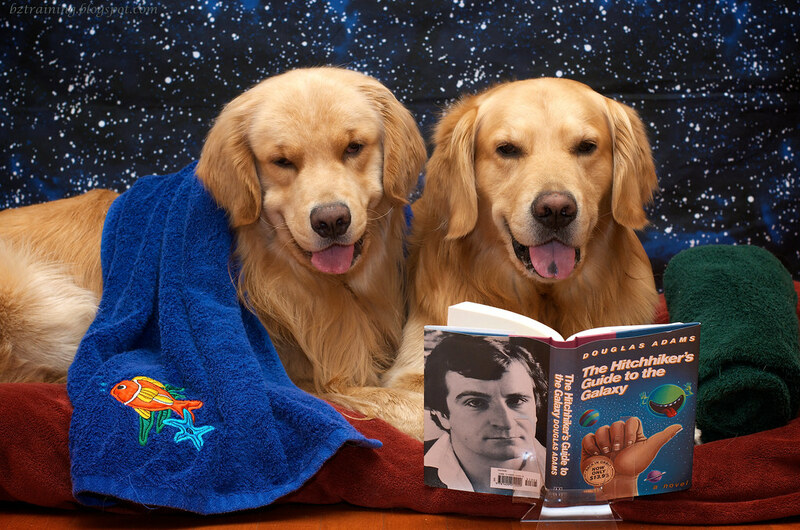 If you are a lover of Douglas Adams' "Hitchhikers' Guide to the Galaxy" and related works, be sure you have your towel! Towel photos should be posted to the pool on May 25, International Towel Day. en.wikipedia.org/wiki/Towel_Day. Our Daily Challenge - May 25, 2012 - "Far Far Away"
I just can't set up without Henry demanding his picture be taken. What a ham! Editor's Note: Yes, I know I promised more pictures of Henry's Hats, but I filled the blog today with towel pictures. I promise to do my utmost to include the hat pictures tomorrow!!! Honest! As for the making of this shot, the background is sheet from a set purchased when we staged our previous home for sale. 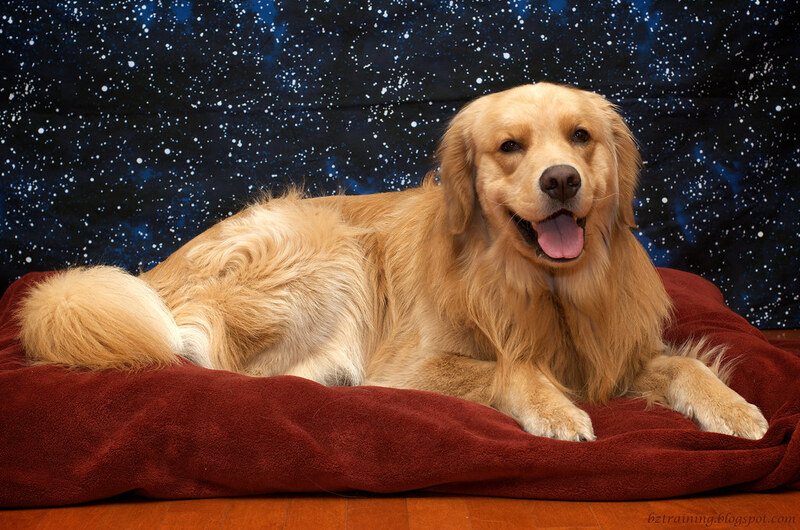 While the comforter is much loved and worn now, the sheet was never used and makes a great (IMHO) backdrop for space themed pictures. The book is resting on a clear acrylic dish holder, and for the first two shots a ramekin filled with treats sits between boys and book. A bit unusually, this shoot was taken in exact reverse order from what you see above. Usually, with "story" posts, the story flows from the shoot itself, with my favorite shot often being one near the end. Recent examples of this include Three Guesses, Loot, and Voted Most Likely To (Part II). An exception to that is the recent round of concluding shots, often a shot with just the props. While I think they make a fitting end to the posts, they are often taken first while I'm testing out lighting, composition, or camera placement. The boys hate it when I do that, and grumble mightily from the other side of the baby gate until I let them in! Mommy says you guys have great taste in books and towels. She says that is one of her favorite books too. Maybe ill get her to read to me soon. Now that set-up is just adorable! Great color contrast also. I absolutely completely adore these pictures! Your boys are just fantastic. I'm betting you plotted this since last year's shot, and that you're already plotting one for next year. These turned out so darned cute! 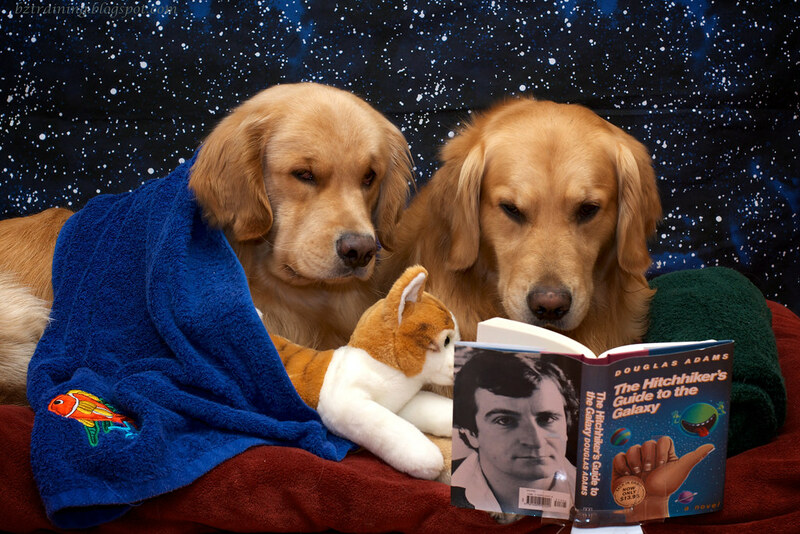 I'm loving all of the towel day shots on Facebook and never even thought of my own furry kids as models. Yours are beautiful - and the pictures are terrific. Keep them coming! Dropping by on the blog hop today - I posted an oldie, but goodie video about the use of military dogs in the wars... to help us remember ALL of the ones who are protecting America overseas. Thank a veteran this weekend - and their dog! 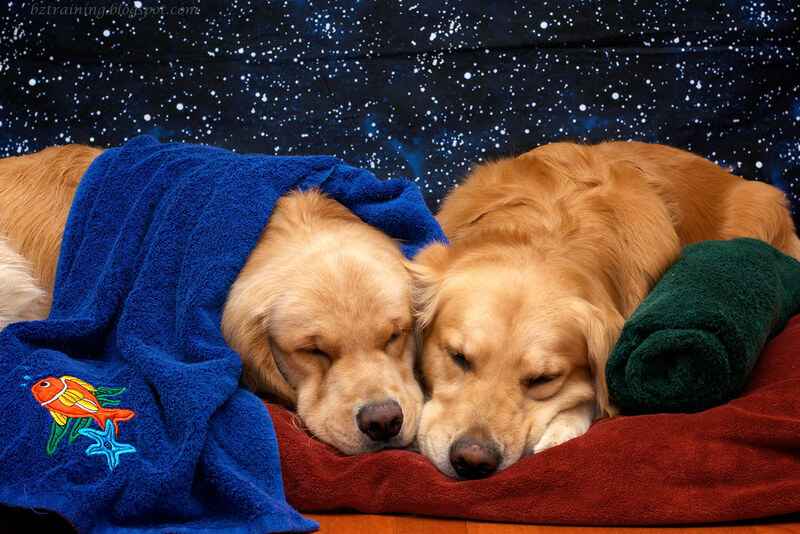 Enjoy the long weekend with your furry kids. enjoy the weekend with your 'boys'!!! They look so cute with the stuffie!